Eastern White Pine (Pinus strobus) is a common native forest and landscape tree in the eastern half of the United States. The Pines (Genus: Pinus) are a prolific genus of trees and shrubs including slightly more than 100 species. This particular species is a long lived tree, some exceptional specimens have been estimated to be almost 500 years old. 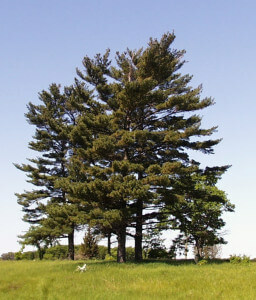 Although it is commonly planted as a landscape tree, Eastern White Pine grows very tall, often approaching 100′, some specimens have been measured to be over 150′. The edibility of Eastern White Pine is unknown by most. Many people are surprised to know how important it was to the Native American diet. Much of this information is also true of some other pine species but Eastern White Pine is a plant with well documented edible and medicinal uses. 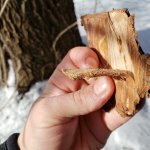 I refer to Eastern White Pine as a hidden wild edible because it is so large and common, but its edible components are not. 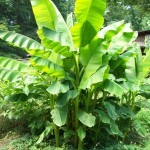 It has no berries, or tubers, or large leaves, so why is it such and important edible plant? Because it gives foragers something to harvest in the winter. 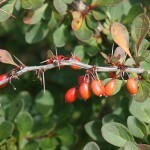 The needles are edible and most commonly used to make a hot tea. The nutritional and medicinal properties of the needles are best preserved by steeping the needles in hot water instead of boiling them, you can steep for as little as 15 mins or a long as a few days. The tea has a surprisingly good flavor, it is bitter, resinous, and slightly sweet but most people end up adding additional sweetener. Eastern White Pine also contains edible inner bark, as unpleasant as this sounds a number of Native American tribes ate this inner bark throughout the winter to prevent starvation. In fact all parts of the tree are non-toxic. Native Americans were creative in their use of white pine, eating any parts of the tree that they could prepare to be palatable including young green pine cones. 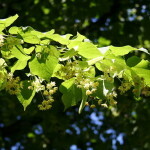 I enjoy chewing on the new growth in the spring, it is not too resinous, and it is soft enough to chew. Some species of pine have nuts inside the mature cones that are large enough to eat. Eastern White pine has very small nuts, they can be eaten, but usually are too much effort to collect. The really surprising thing about Eastern White Pine is its vitamin C content. It has 5 times the vitamin C content of lemons (by weight). That’s one of the primary reasons it’s so important in the Native American diet. 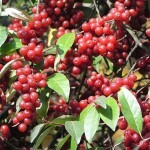 It also contains vitamin A and resveratrol which may have some anti-aging properties. White pine can be an effective medicinal plant acting especially well on the respiratory system to sooth and clear phlegm. It’s no coincidence that this is an abundantly available wild medicinal plant during cold and flu season, and an effective Native American remedy for coughs and congestion. The reason you don’t boil the needle tea is because the vitamin C is sensitive to heat and may break down into other components. 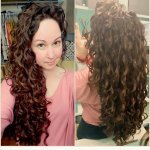 It is a good idea to boil the water and pour it on top of the needles. Way too often the word “pine” is used to refer to all needled evergreen trees or all conifers. The fact is that pines are a certain genus and are distinctly different from spruce, fir, hemlock and other evergreens. Pines are rather easy to identify once you know what to look for. 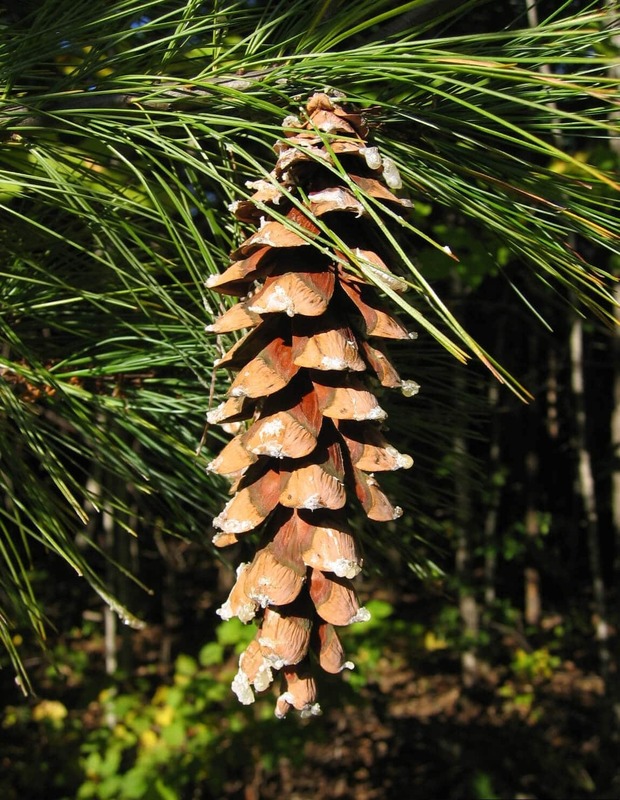 First of all, all pines are conifers, meaning that they produce cones, but not all conifers are pines. Spruce, fir and others are also conifers. Eastern White Pine cones are very visible throughout the growing season but primarily in the fall. The primary way to tell pine trees apart from other conifers is that their needles grow in fascicles. A fascicle is a sheath at the base of a group of needles. 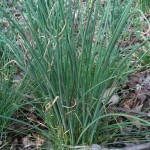 Pine needles grow in groups of 2-5 needles bundled in a fascicle at the base. Most other species of conifers have single needles that grow directly from the stem. 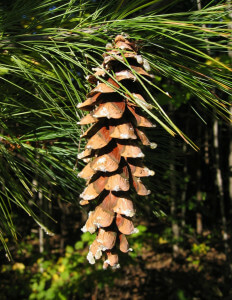 Eastern White Pine has 5 needles to a fascicle and they are about 3″ long. There are other much less common pine trees that have 5 needles to a fascicle but if you’ve found a tree like this then chances are it is an Eastern white pine, but if not then at least you know it is a pine. 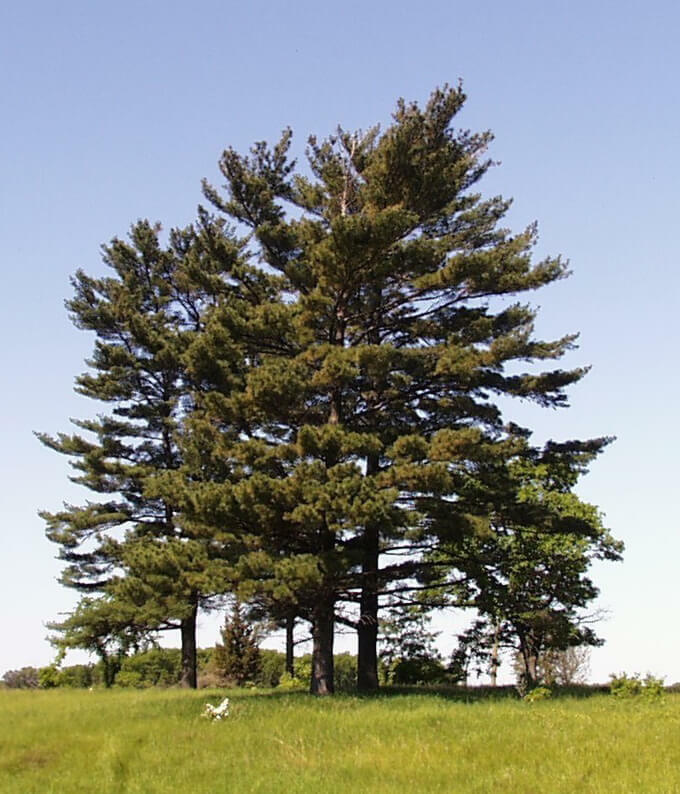 There is one caution when consuming Eastern White Pine. 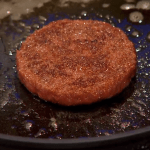 The resin could cause dermatitis in some people. 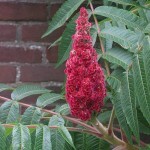 The resin is in every part of the plant so use in small quantities at first. Eastern White Pine is a plant that I thought I was familiar with for most of my life. 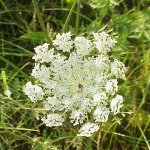 When I found out about its edible and medicinal properties I started viewing the plant as a much more versatile wild edible. I often wondered how Native Americans got their vitamin C. Many people believe vitamin C primarily comes from citrus fruits, and most Native Americans did not have citrus fruit. 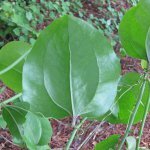 I was also amazed by the fact that this is such a good remedy for cold and flu symptoms and it happens to be abundant in cold and flu season when many other wild edible are not. So if you’re looking for something to forage this winter an Eastern White Pine tree is probably not far away. Just an FYI: Flu is the sickness and Flue is the thing in a chimney. Why did you use lobolly pine needles 3 as an I’d for the white pine which has five? Did I miss something? You make a good point. That picture was the only free to use picture I could find that showed a clear picture of the fascicle of a group of pine needles. I was just trying to show the anatomy of the needles. Thanks for the comment though, I can see how that is confusing. I think I will modify the description of picture so that it states right there that white pine has 5, I put it in the paragraph but It still might be confusing. Hi,I read your blog named “Eastern White Pine, An Effective Remedy For The Common Cold – Eat The Planet” like every week.Your story-telling style is awesome, keep up the good work! And you can look our website about free proxy list.